Paytm offers various free recharge promo code offers and free paytm cashback offers on various products. Now Paytm has announced a new Falt 51% Paytm cashback offer on various bedsheets. If you are looking for beautiful bed sheets for your home it is time to visit Paytm and order your favorite bed sheets with flat 51% Paytm cashback offer. 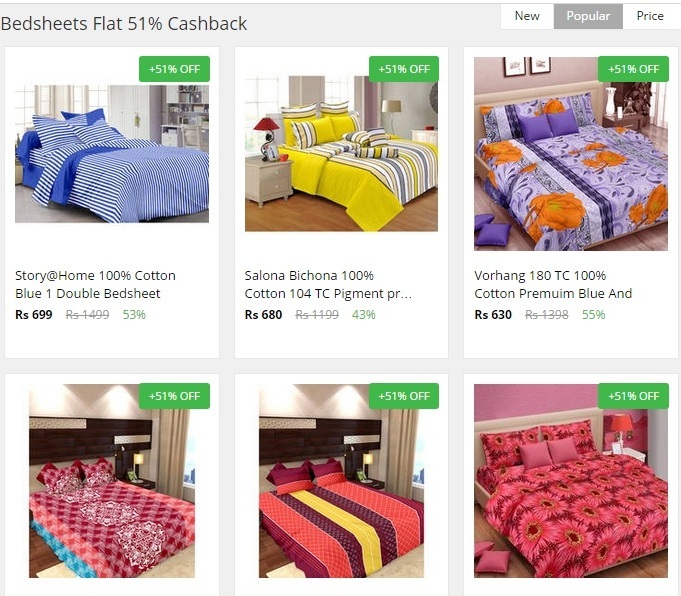 How to avail Paytm 51% cashback offer on Bedsheets? 1. Visit Paytm.com offer page here . 2. Select the desired bedsheets. 3. Select the Coupon code 'HOME51' from the offers available section in product detail page. There will be a select button near the coupon code. 4. Click on Buy button. Sign in or login to buy. 1. Paytm promo code HOME51 has to applied to get flat 51% paytm cashback. 2. Maximum paytm cashback which can be availed is Rs.5000. 3. Cash On Delivery option is not available if you use this Paytm promo code. 4. Terms and conditions by Paytm are applicable. 5. Paytm cashback will be credited within 24 hours of your product shipped. 6. Paytm Cashback will be added to your Paytm wallet. 7. If you want the product to be availed in Cash On Delivery mode, you cannot use this paytm promo code. 8. This paytm offer is a limited time offer.